Many San Dimas residents are looking to artificial grass as a landscaping alternative for their homes and businesses because of its ability to stay looking perfect without the extensive ongoing maintenance of a real grass lawn. Artificial turf stays green all year, with no weeds, mud, bald spots, or discoloration to detract from the beauty of your property’s landscaping. However, before purchasing artificial grass for your San Dimas residence or business, it’s important to consider the amount of foot traffic it will receive. You want to get the maximum longevity from your artificial grass possible, and the best way to maximize this is by choosing the appropriate type of turf for you and your landscaping needs. Duran Lawn Creations carries a range of artificial turf types, from low-impact grass such as Everglade Spring Light to high-impact grass like Fairway Plus, we will have the synthetic grass option that is perfect for your needs. Low-impact grass is to be used mainly for aesthetic purposes, such as residential landscapes. This type of turf should not receive any activity more substantial than walking, and light play from children and pets. Its longer blades provide a more luxurious look, but they can become matted from overuse. High-impact turf, on the other hand, is ideal for areas that will receive high amounts of foot traffic or rougher treatment due to activities such as sports, children playdates, or pets. This type of synthetic turf is denser, more durable, and features a shorter blade height which allows it to last under any condition. Children’s play spaces require a more durable grass type that will both keep your kids safe and keep your lawn looking new. Duran Lawn Creations offers a kid-friendly playground system that features durable, high-impact artificial turf with eco-friendly foam padding and anti-microbial infill. These features ensure that no matter how rough the roughhousing is, both your children and your artificial grass will be protected. 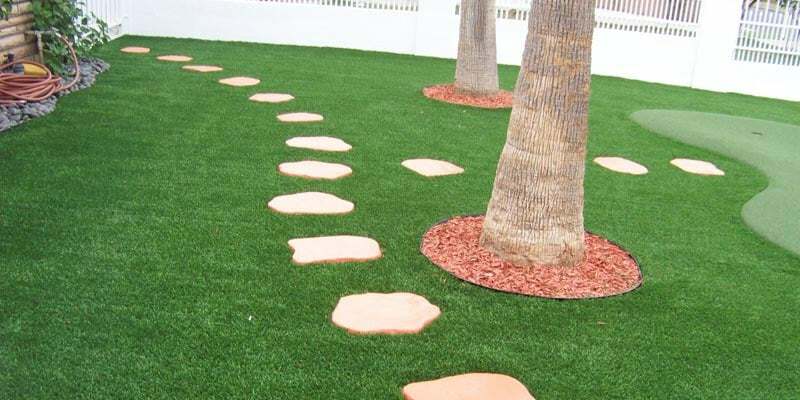 We at Duran Lawn Creations carry a turf tailored explicitly for dogs or other outdoor pets. 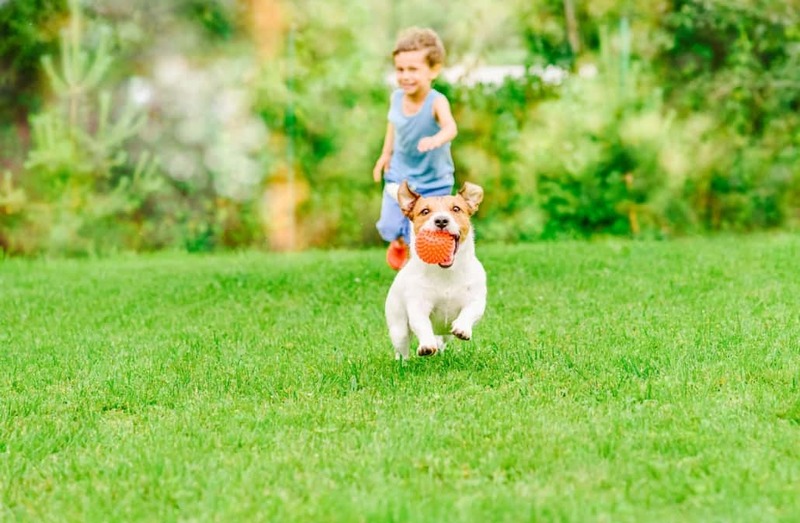 Completely non-toxic, lead-free, and pet-safe, this durable, high-quality artificial grass can withstand the most ferocious playing. The turf contains perforated backing for easy drainage, making pet potty clean-ups easier than ever. The stain-resistant material can be quickly and easily rinsed if needed, and all liquid waste will drain on its own thanks to artificial grasses fast drainage capabilities. No more dead grass, mud holes, or discoloration to worry about. Whether it’s a professional sports field, a San Dimas school playground, or an at-home putting green, Duran Lawn Creations can provide you with the perfect turf for your high-impact artificial grass needs. Our field turf is ultra-durable and has the ability to withstand heavy daily use. It provides a more consistent surface for children and athletes to play on, and it will stay green and mud-free at any time of year. We can also have lines and logos manufactured into the turf, to give you the competitive edge. Whether it’s aesthetic landscaping or durable playground turf, Duran Lawn Creations will provide you with the best type of artificial grass for your specific needs. Give us a call today for a free artificial grass installation estimate at (888) 862-8470.